Be the first to share your favorite memory, photo or story of Jeffrey . This memorial page is dedicated for family, friends and future generations to celebrate the life of their loved one. 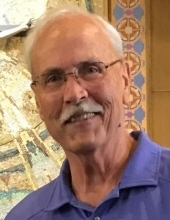 LEECE, Jeffrey Walter - age 67, of Fenton, died Saturday, March 9, 2019 in Florida. Cremation has taken place and a celebration of life service will be held on June 8, 2019 at Jeff's residence. Jeff was born March 10, 1951 in Flint, the son of Edward Otis and Marion Edythe (Lawson) Leece. He married Deborah Johnson on February 9, 1980. Jeff owned and operated A-1 Vending with his son, Jason. He loved spending time on Lake Fenton and in Florida. Family was most important in Jeff's life, especially his grandchildren and he loved attending their sporting events. Surviving are: wife, Deborah of Fenton; four children, Heather and husband, Tony Simmons of Linden, Jeffrey Leece II and wife, Mary of Arizona, Jason Leece and wife, Bianca of Fenton, and Jillian Leece and husband, Phil DiPaola of Waterford; seven grandchildren; three siblings, Jerry Leece and wife, Kim, Joanne and husband, Tom Kundinger and John Leece and wife, Claudia; many nieces and nephews also survive. He was preceded in death by: his parents; brother, Jimmy Leece; and nephew, John Kundinger. Arrangements by Sharp Funeral Homes, Fenton Chapel. Tributes may be shared at www.sharpfuneralhomes.com. To send flowers or a remembrance gift to the family of Jeffrey Walter Leece, please visit our Tribute Store. "Email Address" would like to share the life celebration of Jeffrey Walter Leece. Click on the "link" to go to share a favorite memory or leave a condolence message for the family.